Yes, you are right, this is not a typical Picky Palate recipe 🙂 Over the last 6 months or so, my husband and I have been doing a lot of blending (with our Blendtec) and juicing. I love drinking these in the morning for breakfast, it’s amazing how great you feel. We have a fun juice shop down the street from us called Nekter Juice Bar that we visit often. One of my favorite juices to order from them is their Toxin Flush which has all of the same ingredients as you will see below. I do not know their exact recipe, but you know I was determined to re-create my favorite drink in the comfort of my own home so I could have it anytime I wanted. It ends up I like my version even more. Score! 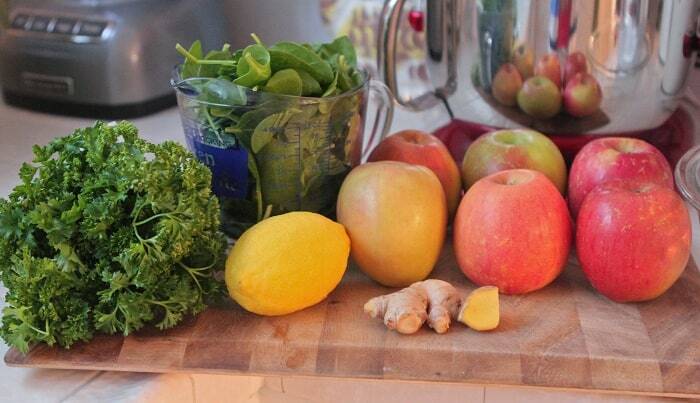 The ingredients for my Power Juice are apples, spinach, parsley, lemon and fresh ginger. Love! Don’t worry, the drink does not taste like parsley or spinach. It just adds a perfect freshness not to mention it’s health benefits. My little guy loves helping smash the fruits and veggies. 1. Turn juicer on and add half of the apples. Add spinach, parsley, ginger, and remaining apples. 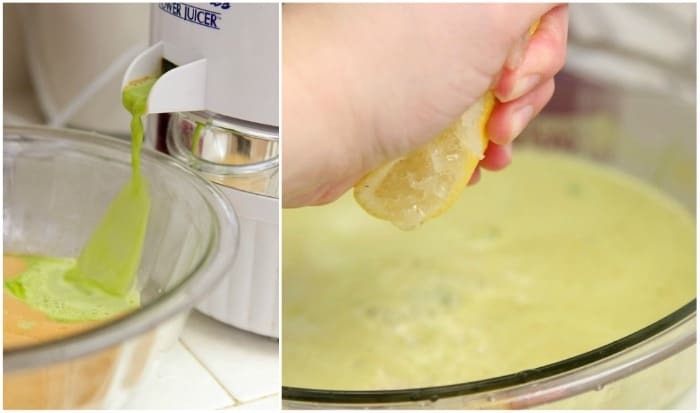 Squeeze lemon into juice. This may not be a blog du “norm” for you but that green nectar is a serious craving at our house. One of our favorite buys is the Odwalla Superfood juice, whose jolly green giant hue is thanks to a hefty dose of Spirulina. But adding ginger takes it to a whole new tasty level. Thanks for going Jack Lalanne on us. Love this post, Jenny, and that you juice. I don’t use my juicer very much anymore..the cleanup takes forever! (after I wash all the produce and clean it, and then actually juice it…then I have to clean up all those parts and pulp). So Ive been slacking on juicing for about….2-3 years now 🙂 Your pics make me wanna start again! I’ve always been curious about juicing…this looks like a great recipe to start out with!! we make smoothies with those ingredients, plus more, on almost a daily basis. 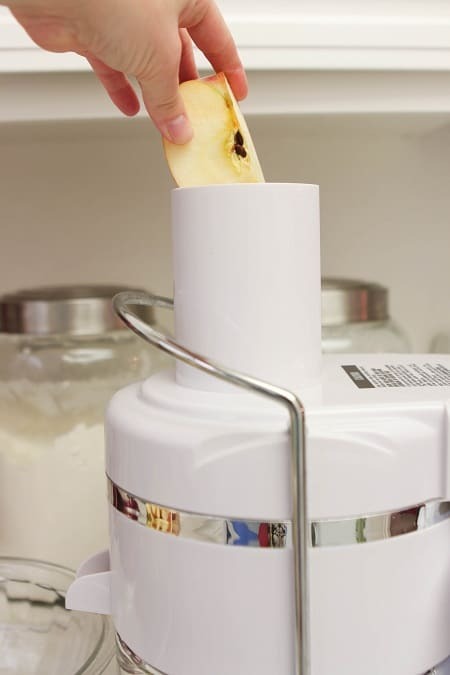 We throw it all (peel and all) into our Blendtec. Clean up takes about 20 seconds and you get ALL of the nutrition. We love it!! I am obsessed with green smoothies right now. Will try your recipe next! I really need to get myself a juicer..are they a pain to clean? I would love to start juicing …. I just can’t get myself to invest again in another appliance … sure looks good though! My favorite part of green smoothies is watching my 4 year old and 2 year old get so excited for them – who’d have thought they’d love spinach and kale so much??? I have a Jack Lalane too, works like a charm! We love juicing as well – we make a big batch and drink it over the next 2-3 days. And if you start with this in the morning, then you don’t feel as bad eating some of your other delicious Pick Palate-created treats! how fun!!! I don’t have a juicer, but I remember that my little guy loved green juice when he was little. Love my Jack Lalane juicer! Wouldn’t mind seeing more recipes like this on Picky-Palate. Thanks for posting! Thanks for the recipe. Just a little note, you should never juice the seeds from an apple. 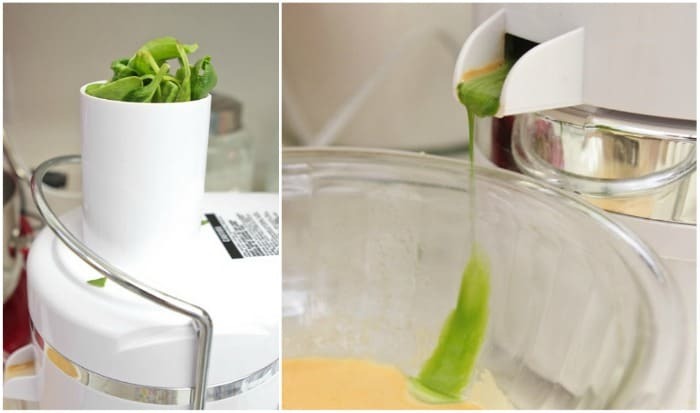 I’ve never used a juicer but it looks fun! Gorgeous! I’m ready to break out my juicer now! So I’ve actually been making fresh juice blends all week. I had much success earlier in the week, but these past two days have been horrible. I was trying out recipes with more greenery (kale, spinach, celery). I’ll have to give this recipe a go! Looks great. I don’t have a juicer, so instead I make green smoothies. If I ever get one though, I’ll check out this recipe! I just started drinking some thing like this Wednesday. It was a work in progress and I do not have a nice juicer just a blender so it is rather a thick mixture. the coworkers are giving me a lot of strange looks while I am drinking this strange green mixture, but hopefully it will be worth it at least I feel better knowing that everything in it is healthy. I have thought about getting some protein powder or something of that nature to add to it any ideas? Where can I find the bottle you used in the photo? 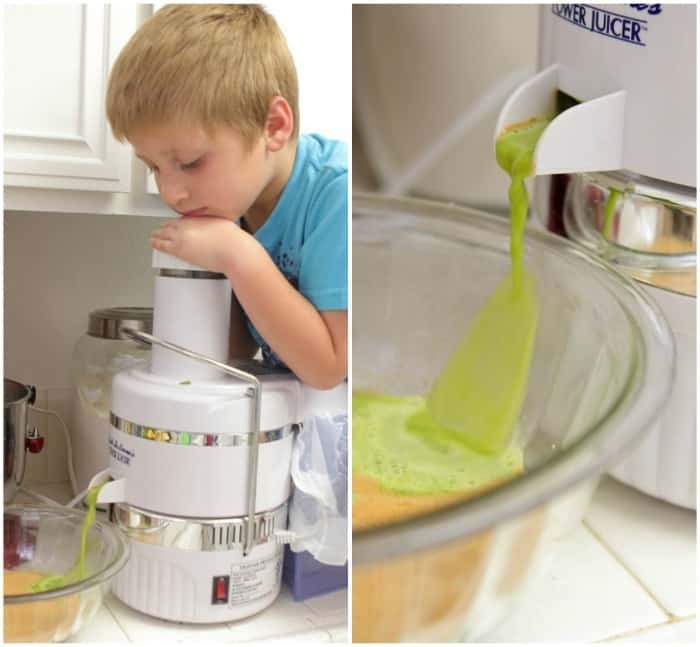 My kids would LOVE to have their green juice in such a fun container! Fresh and refreshing…What a healthy way to enjoy a combination of flavors. I would love to have this gadget too. Thanks for the post! I just got a new juicer recently, and I agree, very fun! This is a very refreshing juice and love the mix here! YUM! I have been juicing too and LOVE it!!! my friend has a great juice blog and one of her tips if if you juice your greens and ginger first then your fruits you will get more of the veggie juice out of the juicer. I have yet to try this with parsley but spinach and kale is super yummy too!! Excellent combo of ingredients. That juice had to taste so-o good. you don’t need a juicer to make this. i use my Vitamix, and drink all the fiber, nothing thrown out. it takes 30 sec to clean up. Any powerfull blender will work. My wife and I recently started juicing, and we’ll have to try this one! I noticed in one of your pictures that you were tossing a whole apple quarter in. I don’t know if you’ve heard this, but apple seeds contain a small amount of cyanide. Most adults are able to absorb and digest this without complications, but it might be potentially harmful to your little ones. You might make sure and cut the seeds out before you toss it in. I LOVE this. If you like to get your fruits and veggies but hate the hasel of having to juice all everything like that, I fell in love with a product from ItWorks Global that gives you all that you need in one all natural powder. Try Greens from ItWorks Global! (https://jerileigh.myitworks.com/Shop/Product/303) Not only do they taste great, they are versatile and can be added to just about ANYTHING – smoothies, juice, yogurt, applesauce, water, etc. One serving of greens provides 8+ servings of fruits and veggies. I loved them so much when I first started taking them that I started telling all my friends and am now distributing them! They are AMAZING and even give you energy! Check them out! Sorry Brian. I’m a botanist… apple seeds have tiny amounts of arsnic. It’s so small that you would have to eat handfuls of seeds to have any issues… and, as the solids are removed, you’re probably not getting much of what is in there in the first place. If there were any concern at all, my OB (13 weeks pregnant) would have said something – she only encouraged my use of the juicer! By the way, I got the Breville Juice Fountain Plus and it’s easy to clean and works well. Also has great reviews. Thanks for the recipe by the recipe. 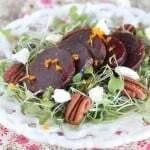 I only just got into juicing and am still collecting recipes for it! 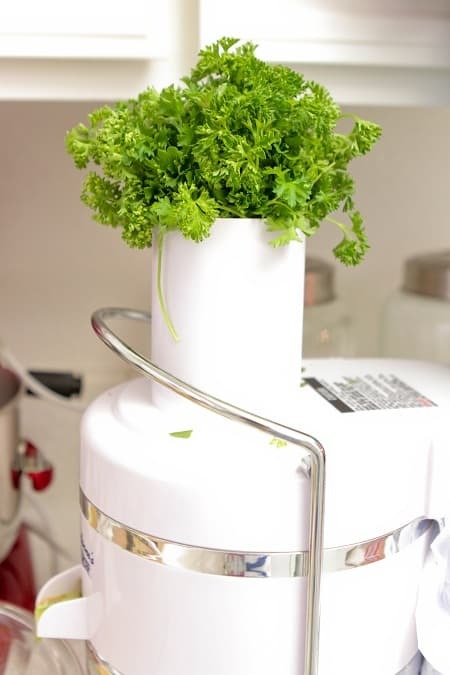 I do not have a juicer, but would love to try this…do you think there’s any way to do it with a blender? The apples would be the only issue i would think. I haven’t tried it with the blender, but it wouldn’t hurt to play around with the same ingredients. 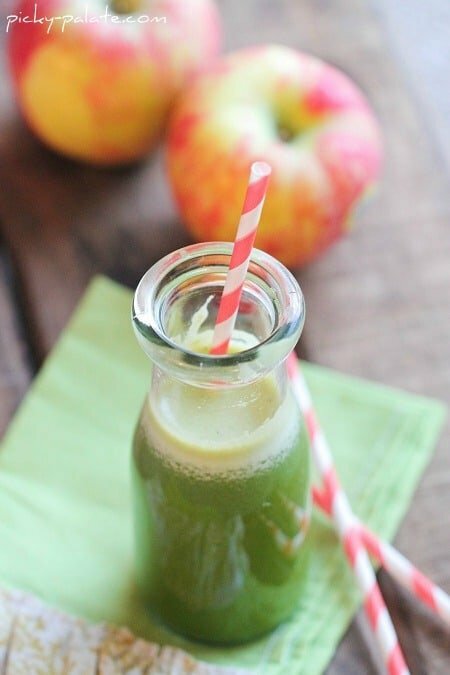 Yum, I love fuji apples, great addition to my green juices. I just made this recipe and it’s definitely better than the one at Nekter! I used 4 granny smith apples and 2 Arkansas black apples and juiced the lemon along with the other items, I also used 1 cup of mixed greens along with the spinach. I got 48 oz, 6 cups of juice, but I used the Omega 8004 juicer, which really squeezes the juice out. Thank you again for posting this recipe!